In April, Orchid will be leading a workshop for the Marion County Gourd Artists on making beautiful gourd necklaces. I must admit I haven’t seen anything like the necklaces that are going to be made in this workshop. 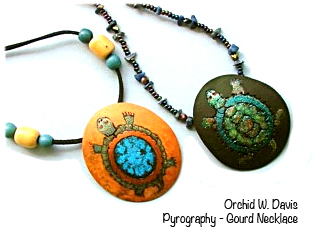 When I asked if there were turquoise stones in the turtle necklace on the left (pictured above) Orchid said the real technique she’ll be teaching is how to burn and paint the gourds to look like they have gemstones. This seems like a kind of Orchid-alchemy. The class is on April 19 , 2014. The class fee is $10 and you need to bring your burners and graphite. Orchid will provide 2 patterns, a gourd cutout ready to burn and leather cord. If you decide you don’t want to make a necklace, then bring a pin back or magnet for your refrigerator. More information can be found on the Marion County gourd artists website. Be sure to register here. This entry was posted in Gourd Pyrography, how to, Orchid's News, Pyrography and tagged Gourd Art, gourds, Marion county gourd artists by Orchid Davis. Bookmark the permalink.